Verrazano, Kentucky Derby 2013: Will this be the year that the Curse of Apollo finally gets broken? 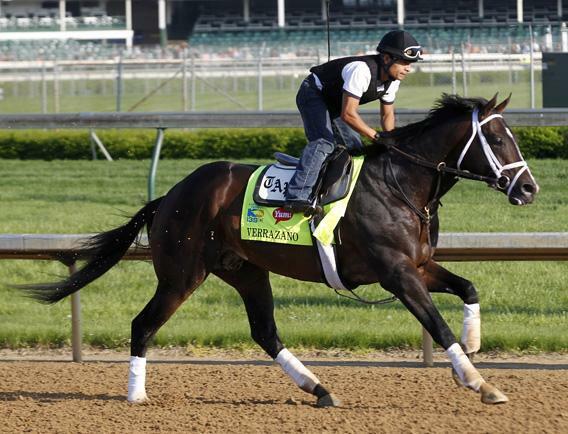 Can Verrazano break the Kentucky Derby’s Curse of Apollo? Verrazano gallops on the track with exercise rider Humberto Zamora during early morning workouts at Churchill Downs in Louisville, Ky., on May 1, 2013. In that wet spring of 1882, Runnymede was the fastest 3-year-old in America. The Kentucky Derby was only in its eighth year and not yet a substantial draw on the American horse-racing circuit. As such, Meriwether Lewis Clark Jr., the mustachioed booster who had conceived the race as an equine Mardi Gras that would make Louisville, Ky., the equal of any river city, had to beg the colt’s owners to ship their prize possession west. Runnymede’s owners, the New York meatpacking millionaires the Dwyer brothers, loved to gamble, so they agreed on the condition that they could also ship in their own Manhattan bookmakers. Clark had imported pari-mutuel betting machines from France, just to keep crooked bookies away from his track. But if Clark had to tolerate bookies to get Runnymede, he would tolerate bookies. On a rainy Derby day, the bookmakers made Runnymede the 4-5 favorite. He ran like a favorite for most of the race, twice escaping from behind running roadblocks of horses, and making up six lengths in the stretch. With 400 yards to go in the mile-and-a-half race, Runnymede took the lead. But behind him, daredevil African-American jockey Babe Hurd—black riders were actually fairly common in the post-bellum South—was weaving his mount, Apollo, between tiring horses. Two hundred yards from the wire, Apollo drew nose-to-nose with Runnymede, then dug through the mud to win by half a body length. Late last fall, the curse was on owner Bryan Sullivan’s mind. As a 2-year-old, his promising colt Verrazano had suffered shin problems that delayed his debut at the track. By the first week of December, though, Verrazano was training well, and Sullivan sat down with trainer Todd Pletcher to discuss the horse’s maiden race. At first, they considered a six-furlong sprint, scheduled for Dec. 19. But Pletcher thought Verrazano needed more practice bursting from the starting gate, and since he had only four months to build up to a mile-and-a-quarter—a tight schedule for a Derby horse—Pletcher wanted him to start at seven furlongs (seven-eighths of a mile). “Is 24 hours really going to make a difference?” Sullivan says Pletcher asked him. Although thoroughbreds are foaled in late winter and early spring, their birthdays are observed on Jan. 1. As a consequence, when Verrazano stepped into the gate on New Year’s Day at Gulfstream Park, he was a 3-year-old. Verrazano won his maiden race (which turned out to be 6 ½ furlongs). Then he won at a mile, by such a wide margin that the race caller crowed, “He’s gonna win this one from Brooklyn to Staten Island.” Then he won the Tampa Bay Derby. And then Aqueduct Racetrack’s Wood Memorial, whose champions have gone on to win the Kentucky Derby 11 times. The Churchill Downs oddsmaker now lists him at 4-1 on the morning line, meaning he could be the second straight cursed horse to go off as the favorite. Last year’s favorite, Bodemeister, went out so fast he couldn’t hold off I’ll Have Another in the stretch—a rookie mistake compounded by a rookie’s inability to go the distance. Is that confirmation that the curse is real? Would Bodemeister have won the Derby had he not been so green? You can’t get two handicappers to agree on anything. If you could, there’d be no point to playing the horses—every winner would pay $2.10. Andrew Beyer is the Washington Post columnist who used his Harvard English degree to revolutionize handicapping by inventing the Beyer Speed Figure. Steve Davidowitz, author of Betting Thoroughbreds and editor of GradeOneRacing.com, has been Beyer’s racetrack buddy ever since they met in the paddock at Saratoga in the 1970s. Beyer thinks the Curse of Apollo is real—he believes that horses who don’t start racing until January lack the preparation time of peers who began the previous summer or fall. Davidowitz thinks that’s booshwah. Davidowitz, by contrast, says the curse is just one of those windbag railbird aphorisms on the order of never betting a horse who hasn’t raced in the past 15 days. He notes that Fusaichi Pegasus, the 2000 Derby winner, ran his first race in December 1999. It’s hard to imagine the outcome of the Kentucky Derby would’ve been any different if he’d run his maiden race a few days later, after the Curse of Apollo cutoff. Besides Bodemeister, only two recent cursed horses have finished in the money at the Derby: Strodes Creek, who placed in 1994, and Curlin, who showed in 2007. Curlin, who went on to win the Preakness and the Breeders’ Cup Classic, was the best horse of his generation but did not start racing until February of his 3-year-old year—on Derby day, he was still a race short of running like a champion. The real Curse of Apollo may be the pressure to rush young Derby prospects to the track. An Australian study found nothing harmful about racing 2-year-old horses, as long as they’re mature enough. But in the United States, Derby qualifying races are run in late winter and early spring, denying juveniles a rejuvenating three-month break between seasons. It’s a fait accompli that the Derby winner will retire young, because he’s more valuable as a stud than a racehorse. No matter how fast Verrazano runs on Saturday, he’s not going to break that curse.